In addition to our range of completed spoons, we also provide a selection of pre formed spoon blanks that offer you the opportunity to carve your own spoon. Our blanks are perfect for those just starting out in the world of spoon carving, as all of the initial rough shaping has been completed for you, they also are equally as good for those who have some carving experience, but perhaps don't have time to make their own blanks or simply don't have access to suitable materials. All of our spoon blanks are rough carved/sawn and feature tool marks from their manufacture. Our spoon blanks are crafted from food safe UK woods, including, but not limited to, Sycamore, Birch, Willow & Hazel. The eating spoon blanks are supplied as a flat section blank, thereby enabling you to carve a side profile and spoon/bowl thickness that you find comfortable in an eating spoon. The spoon blank is rough carved/sawn and features tool & cut marks from it's manufacture. Style varies. Size - not less than 15cm in length. Nice & simple, uncomplicated eating/small cooking spoon blank, crafted from food safe UK woods and supplied as a flat sectioned blank, thereby enabling you to carve a side profile and spoon/bowl thickness that you find comfortable. 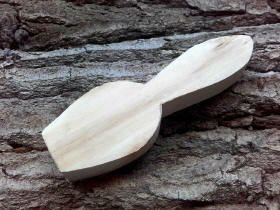 The spoon blank is rough carved/sawn and features tool & cut marks from it's manufacture. Size - not less than 16cm in length. 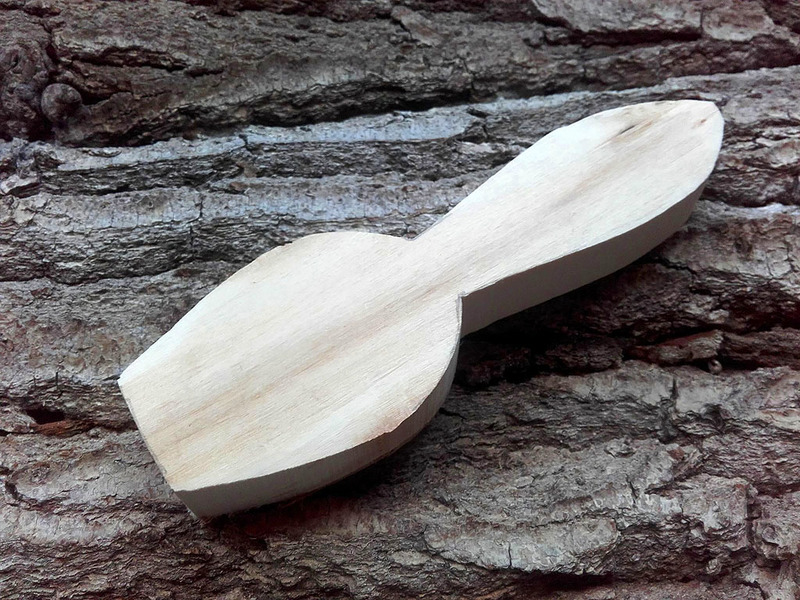 Spoon blank for our popular cooking spoon, crafted from food safe UK woods and supplied as a flat sectioned blank, thereby enabling you to carve a side profile and handle/bowl thickness that you find comfortable in a cooking spoon. Size - not less than 20cm in length. The stubby spoon blank is supplied as a flat section blank, enabling you to carve a side profile and spoon/bowl thickness that you prefer. The tip has been left squared off so you can carve a broad lipped spoon or bring the sides round for a more traditional tear drop shape. A Dala Horse is a traditional wooden interpretation of a horse that originates in the province of Dalarna, Sweden. 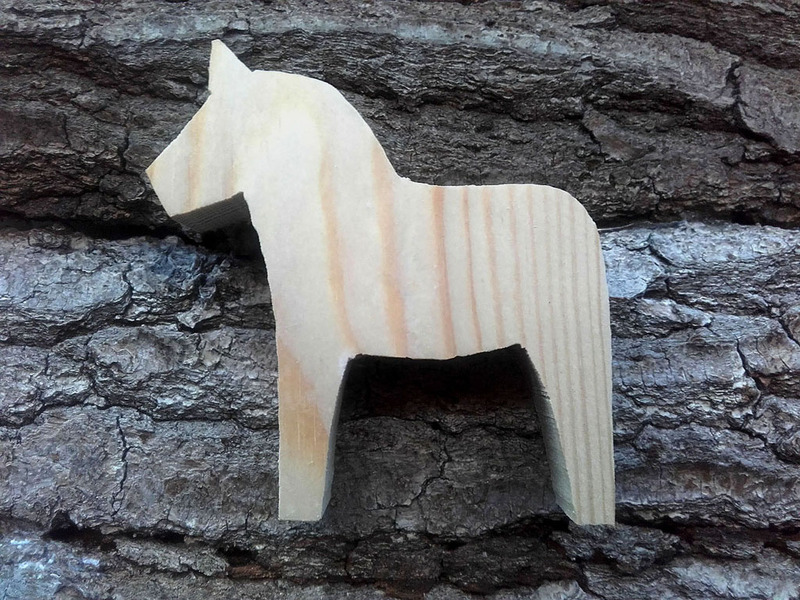 Our Dala horse blanks are perfect for whittling by the fire on long dark winter evenings, they are also an ideal whittling project for children using a small pocket knife, under supervision of course. Our Dala Horse blanks are made from recycled timber and feature tool and cut marks from their manufacture. Size 8.5cm wide x 9cm tall x 2cm thick. Prices exclude delivery unless otherwise noted, UK Delivery via Courier from £ 6.95.